Springbrook-Waskasoo Life -- Trails Old and New near Springbrook (including Red Deer Regional Airport, Harvard Park, the former Mynarski Park) and area. Long before Springbrook, Mynarski Park or the British Commonwealth Air Training Plan, the area was central to major transportation corridors. First, of course, was the Red Deer River, a few miles to the west. 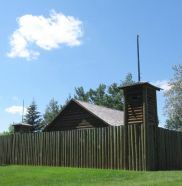 Then, during the 1800's and earlier, there were ancient trails (portions of which became known as the Wolf Trail, Bow River Trail, Old North Trail, Blackfoot Trail, Fort Benton Trail) that extended between Fort Benton in Montana to Fort Edmonton to the north used by aboriginals, fur traders and early settlers. In this area, it ran just east of the river to Red Deer Crossing, one of the better fording points on the river where later Fort Normandeau was built, a ferry service established and a settlement developed. 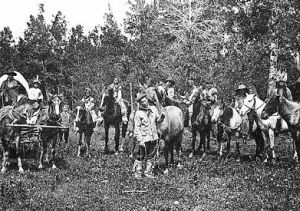 Around 1873, these ancient trails were improved and became known as the Calgary and Edmonton Trail (C & E Trail), the most dominant north-south route in Alberta. It became a major stage coach route upon the arrival of the Canadian Pacific Railway in Calgary in 1883. In 1890-91 when the Calgary and Edmonton Railway was built, the railway followed more or less the same general corridor as the C & E Trail with several adjustments in alignment to accommodate better grades. From Innisfail north to Red Deer, the railway ran a few miles east of the Trail. 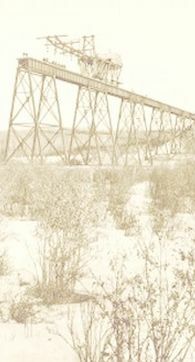 During the 1890's, an additional road was built to follow the railroad and the towns the railway built or went through. This new road eventually became Highway 1 in the 1930's and renamed Highway 2 when the Trans Canada Highway was being built as an east-west highway in the 50's. It became Highway 2A when the four lane Highway 2 was built in the early 1960's. Meanwhile, several portions of the C & E Trail have been maintained as country roads. Highway 2 between Calgary and Edmonton is now the Queen Elizabeth II Highway, part of the Canamex Highway Trade Corridor. In the present day, there is much interest in creating walking, biking or other types of trails in the vicinity using the river, C & E Trail, and Highway 2A corridors. The Trans Canada Trail from Red Deer south to Olds and beyond will go through Springbrook. The portion already built goes through the natural area south of Springbrook and will be extended along Range Road 281. 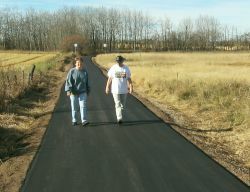 Other trails may be developed along the Highway 2A corridor between the highway and the railway, the Waskasoo Creek corridor, the Red Deer River corridor, the abandoned Alberta Central Railway corridor and some country road allowances. Although Alberta Transportation had generally not been supportive in the past of trails within highway corridors, times are changing and there is now a new openness to the concept.